JOHNSON’S Baby Oil locks in ten times more moisture on wet skin than an ordinary lotion on dry skin. Clinically proven to help prevent excess moisture loss, JOHNSON’S Baby Oil is gentle and easy to spread, so makes great for baby massage, leaving your baby’s skin soft and smooth. 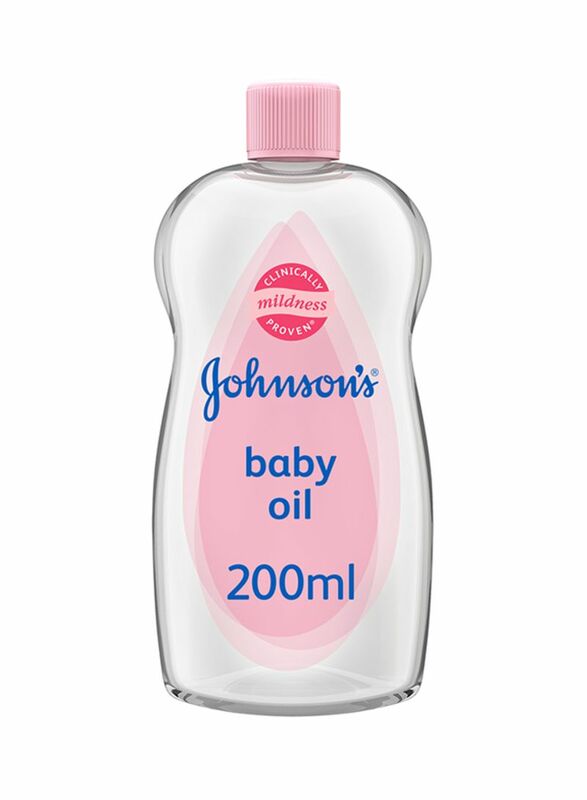 JOHNSON’S Baby Oil is especially developed for new-born skin, creating a light protective barrier on the skin. It can also be used to soothe and relieve dry, rough patches on adult skin. JOHNSON’S baby care products. Trusted by moms for over 100 years! Use after baby bathtime when you want to help seal in moisture and refresh dry skin. Pour a small amount onto palms and rub hands together to warm, then gently apply onto skin. For external use only. If rash occurs, discontinue use. Keep out of children's reach to avoid drinking and accidental inhalation, which can cause serious injury. Should breathing problem occur, consult a doctor immediately. Do not use if quality seal is broken. For over 125 years, JOHNSON’S has provided safe, mild and gentle products for babies and adults. All JOHNSON’S baby products are soap-free, hypoallergenic, dermatologist-tested and paraben-free as part of our promise to enable a healthy future for all babies. Every JOHNSON’S product is made with the purest and highest-quality ingredients because we are committed to happy, healthy development.